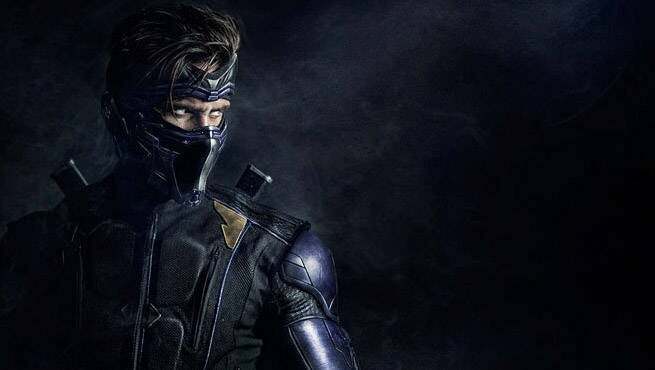 Valiant fans will finally witness one of their favorite characters come to life in a new live-action Ninjak series, and the company has released the first look at star Michael Rowe in full costume. The costume is incredibly sleek, with the only pops of color coming from a few blue tinted overlays and the slim gold accents, and many suspect that the first footage from the upcoming project will be shown at this year's New York Comic-Con at Valiant's panel. The project is being directed by Bat in the Sun's Aaron and Sean Schoenke, who are known by fans for their work on the incredibly well received Super Power Beat Down YouTube series. In addition to Rowe as Ninjak, the project will star Kevin Porter (Dodgeball), Ciera Foster (Straight Outta Compton), Michael Rowe (Arrow, The Flash), Jason David Frank (Power Rangers), John Morrison (Lucha Underground), Derek Theler (Baby Daddy), and Chantelle Barry (Entourage). More details about the project will be revealed at the Valiant x Bat in the Sun panel at NYCC, and fans will get an exclusive item to take home. If you can't make it to NYCC however, you can always tune into Hyper RPG's Twitch channel to watch the live presentation. You can get an up-close look at the new costume in the gallery.